AUSTIN, Texas, Sept. 9, 2011 (SEND2PRESS NEWSWIRE) — 360 Mortgage Group, a privately owned wholesale mortgage bank, welcomes David White as an account executive. White brings more than 20 years of mortgage industry experience in territory management, relationship building and account management. Prior to joining 360 Mortgage Group, White worked as an account executive for Wells Fargo, Mortgage Services III, Homecomings Financial and Sierra Western Wholesale, as well as a mortgage loan consultant for Sierra Western Wholesale. White holds a Bachelor of Science degree in business administration from the University of Florida. 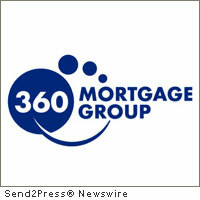 Established in 2007, 360 Mortgage Group, LLC (http://www.360mtg.com) is a privately owned mortgage bank that has successfully utilized its high-technology platform to provide better communication and customer service to business partners. An approved Fannie Mae seller/servicer, 360 Mortgage Group is centralized in Austin, Texas and services more than 25 cities across the United States.